Paul James works on his family team’s Sand and Deliver sculpture in 2017 during the 56th Annual Corona del Mar Sandcastle Contest, presented by Newport Beach Chamber of Commerce’s Commodore’s Club. This year’s event is scheduled for Sunday at Big Corona State Beach. The sand at Corona del Mar State Beach will be transformed this weekend into palaces, statues, and ocean life, big and small, as part of the annual Sandcastle Contest. The 57th Annual Sandcastle Contest presented by the Commodores Club of the Newport Beach Chamber of Commerce will run from 10 a.m. to 4:30 p.m. Awards are typically handed out around 3 p.m.
“Have a chance to win cash prizes and have a great day at the beach,” organizers exclaim on the event website. Teams can consist of family, friends, work, church or school group. Event participants receive a free T-Shirt. To enter: Families and civic organizations, like church, youth, or services groups, cost $30; businesses cost $40; and it’s $60 to enter the Master’s Class for architectural firms or professionals. Chamber of Commerce President Steve Rosansky promoted the event during the Wake Up! Newport meeting on Thursday morning. It’s going to be a fun event, he noted. “Who likes to build sandcastles?” Rosansky asked the crowd, many cheering in response. 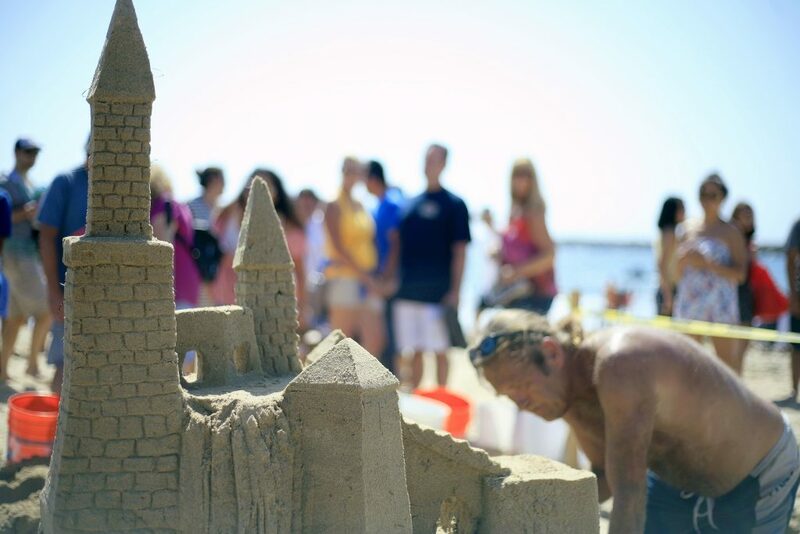 In past years, thousands of locals and visitors have flocked to CdM State Beach to watch sand sculpted into castles, marine life and other creations. Typically, about two dozen teams participate in the annual event. Some are first time sand sculptors, while others are seasoned experts. The event is sponsored by The UPS Store, as well as Balboa Bay Resort, Marriott Newport Beach, Theodore Robbins Ford, Buffalo Capital Corporation, Doggie Walk Bags, and Criss Crosson’s Sand Castle Kit. Other participating sponsors include Surterre Properties, EmbroidMe, and Redwood West.